Peter Lovenheim is an author and journalist whose articles and essays have appeared in The New York Times, Parade, The Washington Post, and elsewhere. He teaches nonfiction writing at The Writers Center in Bethesda, Maryland. His previous book is In the Neighborhood, winner of The First Annual Zócalo Public Square Book Prize. "Every reader will find this book about attachment enlightening -- and above all, moving. The author takes a personal approach and shows how learning about the new science of attachment helps him understand himself and his life – in fact, the lives of all of us. An easy, absorbing read!" "This remarkable book can be read in several ways. Each makes us more informed and better off. As an overview of a major body of research and social psychological theory; as a source of improved understanding of ourselves--and to better attach to others." 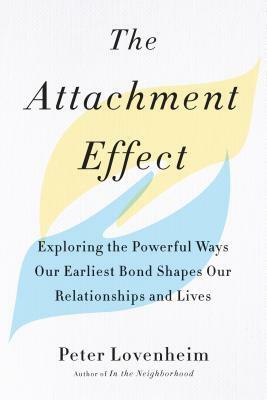 "With remarkable frankness and rare insight into his own experiences and those of many others he interviewed, Peter Lovenheim shows in The Attachment Effect how we can improve all our relationships--from work to romance, parenting to politics, youth to aging--even if events beyond our control during infancy started us off on the wrong track. An incisive work that can guide everyone to have a better relationship with every individual who matters in their lives."